Like your Tomatoes really big? Want to wow the neighbours and have some fun? Have a little contest among your friends! Grow these giants for taste, too. Heirloom favourites. One packet each of T & T Monster, Oxheart, and Prudens Purple. 25 seeds in each packet and a bonus package of 25 Brandywine seeds. Start seed indoors 6 – 8 weeks before transplanting out to the garden. Cover seeds with 1/2 cm (1/4 in) of soil. Firm soil over seed. Keep moist but not waterlogged. To germinate maintain a soil temperature of 24 C (75 F). Seed should germinate in 6 – 10 days. Once seeds have sprouted, 14 – 16 hours of light per day is essential. Once plants have reached 12 cm (5 in) transplant to 6 cm (3 in) peat pots. Place the root ball at the bottom of the pot, filling pot with soil will ensure better root development along the stem. 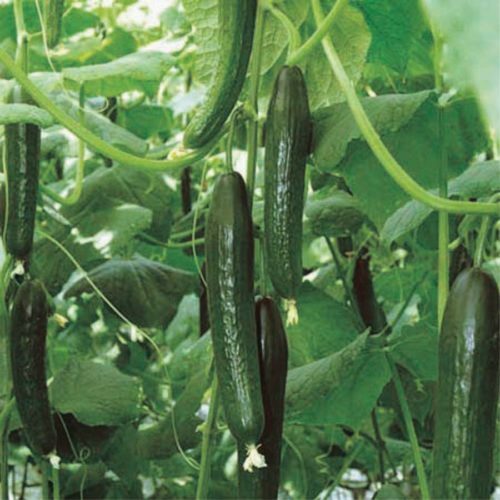 Plants will develop better with a growing temperature of 17 C (62 F) until transplanting out. Fertilize weekly with 10-52-17 and liquid seaweed for strong root development. Do not transplant out till night temperatures are warm. How big a Tomato can you grow? We don’t expect anyone to grow anywhere close to the current record holder Dan Sutherland of Walla Walla, Washington, USA. On August 30th, 2016 it weighed an amazing 3.906 kg (8.61 lb)! But there’s always fun in trying! $100 for the third largest! Anything over 2 pounds will probably be a pretty good qualifier. But who knows! Have someone take a picture of you holding it (by your face) and get the produce manager of a local grocery store to weigh it and sign the entry sheet we provide when you order any of our Giant Tomato seeds. Send us the photo and entry sheet by September 15th, 2019. Thats it! Ready, Set, Grow! Pinch and remove suckers that develop in the crotch joint of two branches. They won’t bear fruit and will take energy away from the rest of the plant. However, go easy on pruning the rest of the plant. You can thin out a few leaves to allow the sun to reach the ripening fruit, but it’s the leaves that are photosynthesizing and creating the sugars that give flavor to your tomatoes. Fewer leaves will mean less sweet tomatoes. Water deeply and regularly while the fruits are developing. Irregular watering – missing a week and trying to make up for it – leads to blossom end rot and cracking. The rule of thumb is to ensure your plants get at least 1 inch of water per week, but during hot, dry spells, they may need more. If your plants start to look wilted for most of the day, give them a drink. Once the fruit begins to ripen, you can ease up on watering. Lessening the water will coax the plant into concentrating its sugars, for better flavor. Use your judgment. Don’t withhold water so much that the plants continually wilt and become stressed or they will drop their blossoms and possibly their fruit.